I acquired a fog light accessory harness for my fogs and was disappointed by how poorly it was designed. Whoever designed it lacks any knowledge of Honda's electrical systems making believe it must of been handed off to a marketing intern in japan. The harness seems to be based on the cheapest jdm accord. North America is Honda largest market and should have been able get a proper harness, which actually would be cheaper to produce and easier to install than the one we got. The first sign of this is when looking at the fog light switch. The fog light switch back lighting does not connect to the dimmer, it connects to ground. This makes the switch full bright at times. So if you dim you lights, the hazard and defogger are dim but fog light switch is still bright. All US and Canadian cars have dimmers, so why do this? From wiring diagrams, I believe base model JDMland cars do not have a dimmer. Honda oem fog light systems(on relayed lighting setups) use a single relay not two like the accessory harness. The accessory harness second relay uses the high beam negative output to energize a relay to interrupt the fog light relay and switch's 12v inputs. On oem systems, there is an output from the hi/low switch built into the headlight switch. That output grounds a single fog light relay only when the low beam is on. Accord light switches do not have this output built into it, so the accessory harness designer added a relay instead of replacing the light switch. In reality, someone should of picked up a wiring manual. The accord does have a negative switched low beam only signal. It is the normally closed terminal of the dimmer relay. The dimmer relay turns on and off the high beams. When the dimmer relay is on, ground is output to the high beams, and when off, ground is output to an unused terminal on the bottom of the underhood fusebox. The terminal is in the very same connector the accessory fog harness 't's into. Almost like the original electrical designers had prepared for the fog lights. Even though the stock connector terminal is empty, the some of the accessory fog harnesses add the jumper wire into the 't' but do not take advantage of it. The accessory harness crosses the car and connects to power at the dash fusebox. All this is really unnecessary since there is an unused fuse location(fuse 21) in the underhood fusebox. On jdm cars this fuse connects to the 's' sense terminal of the alternator. On North American cars, the alternator is control by the ecu/eld. Fuse 21 maybe unused but it is fully connected inside the fusebox. Meaning all you have to do to use it is simply add a terminal to a fusebox connector. The accessory harness already makes you remove the fusebox to 't' into a connector on the bottom, so why not add a terminal instead running wires across the car? Extra wiring, extra relay, extra labor time to install, no back light dimmer to me equals extra cost for negative benefit. You might think bean counters at their finest but I have 3 fog light harnesses and each one is different. So if they are spending money making production changes, why not do it right? Harness 1 and 2 use the low current high beam output from the headlight switch to drive the interrupt relay but harness 3 uses the high output after the dimmer relay instead. 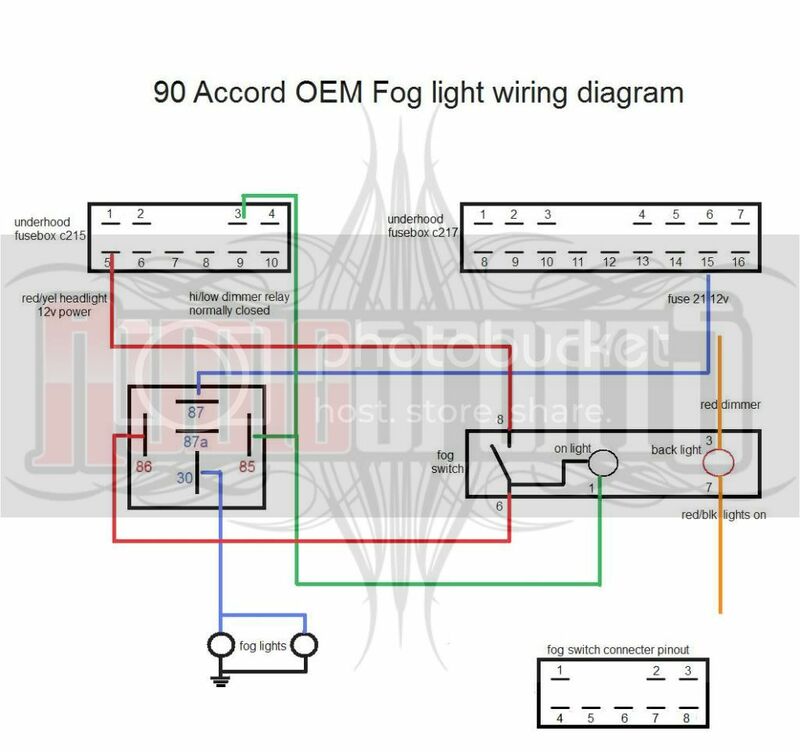 So for anyone who wants to make their own fog light harness and work like oem and not accessory, here is a diagram. If you compare the 5th gen harness to ours it's designed much like you suggest. It even taps power from the underhood fuse box. In fact, it may even be compatible as the fuse box connector and switch connector are the same. Thanks for this, I've wanted to re-do my wiring harness for years. Do these pinouts apply to all years 90 - 93? Also, is there an alternative to be able to use the fogs with just the parking lights on, in addition to low beam mode? Why would you need foglights without headlights? to look cool, why else. to look cool, why else. I mostly just wanted to hear you say it. Also as driving lights in daytime low visibility conditions Again, why not just use your headlights? You make it sound like you need them to operate in a scenario where they currently don't. The factory design is bad and can be annoying, but not for the reasons you want, in my opinion. The other benefit could be so you could use them with your high beams. And i'd rather them come on with the headlights, that way i can leave the switch pushed in at all times and they just come on when i turn on the headlights, this way i don't have to push the switch every time i want them on, they're basically always on with the headlights. true and why would you need fog lights without headlights while theres no fog? Also the H3 bulbs I run are 10$, compared to my "lifetime warranty" HIDs, which are a pain to warranty. So if I don't have to run them, I won't. I've been running a self built harness, but they don't turn off automatically with the high beams. I'd like it to do that, but retain my running light feature. Thats what i was going to add. the above diagram will work, change the red/yel wire from fuse box to feeding the switch to red/blk park light signal. Then the fogs will light up in parking, low beam and switch off with high beam.